WE RELY ON CUSTOMER FEEDBACK TO HELP US SERVE YOU! 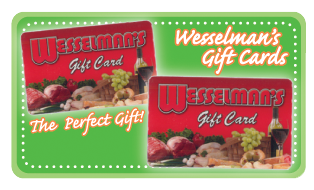 Wesselman’s Gift Cards make the perfect gift for everyone, even that hard to buy for person on your list. They are available in any denomination as well. Wesselman’s Gift Cards are located at all Wesselman’s locations.